As collectors of curious and intriguing objects, Barbara and Claudia have delved into the past to explore humankind's passion for accumulating beautiful, odd and marvellous things. This book provides a glimpse into their collections through essays, images and objects, presented together in an imaginative and elegant package. By means of the two essential wunderkammer divisions, Naturalia and Artificialia, Hodgson and Cohen scrutinize the practical, the esoteric, the aesthetic and the bizarre. In Naturalia, they divide natural history into evolution, metamorphosis, sea life, herbaria, crystal structures and ornithology. In Artificialia, creations by artists, artisans and scientists, they include labyrinths, rules of perspective, timepieces, scientific instruments, exotic artifacts and magic delights. The book (8.5 x 10.25 inches, 56 pp.) was designed and composed in Bembo by Barbara Hodgson. Reg Lissel spent ten months making over 1,000 foolscap sheets of paper specially for this project, which were printed damp by Rollin Milroy at Heavenly Monkey. 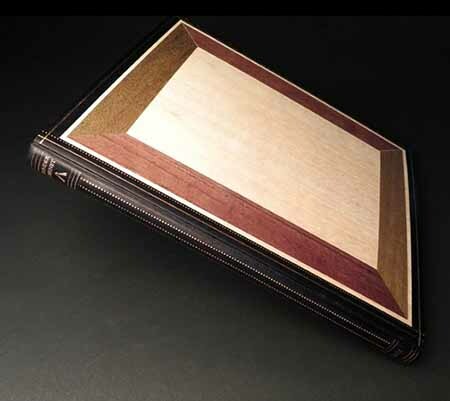 Each copy is contained in a box decorated with onlaid wood veneers forming geometric patterns. Inside, in addition to the book, the box contains in various compartments a unique assortment of approximately two dozen objets culled from the creators' own collections (e.g. 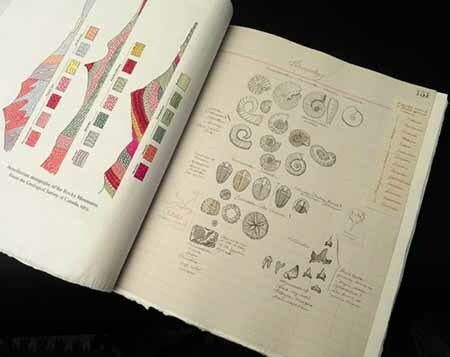 shells, fossils, plants, optical devices and plaster casts) with a descriptive listing (each list written out by one of the authors), making each copy a unique wunderkammer in its own right. Copies 1-10 were bound in were full leather with geometrical trompe l'oeil onlays, and issued in a special two-drawer specimen cabinet containing additional items. Copies 11 - 30 were bound in leather with wood veneer onlays, matching the boxes, and gilt tooling. © 2016 Heavenly Monkey. All rights reserved.